Looking to enhance those beautiful green eyes you have, just not sure what colors and styles fit you the best. There are somethings you may want to consider first. Things like what color green eyes do you have? the color of your skin and shape of your face. You can always experiment, using all kinds of different colors and styles. You may like something that I did not mention. In the end this decision is completely up to you but you may end up with some results that you were not looking to get. Below I will post the best and ways you can make those beautiful green eyes stand out so much you will have people asking if they are your real eye color or colored contacts. First and foremost you will want to find out what shade of green your eyes are. There are a few different greens. The suggestions I am going to give you below will work for most green eyes. Eye shadows. Browns are beautiful for green eyes. The best are darker tones of brown, almost like a chocolate color. You can also go with a dark green color that has a copper or gold high light to it would make a great color. If you are looking for something to highlight the eye you can try a light orange color, like apricot or taupe. Darker purples along with colors that are shiny like a metallic color accentuate the eye perfectly. These next few colors are ones that you want to try and keep away from. I mean the decision is really up to you as I have said before but these are some colors that just really do not look well. Blue is a terrible color for green eyes. Any color blue will not look good at all on those green eyes. Silver is very pretty color for eyes, just not really so much for green though. Eyeliners. 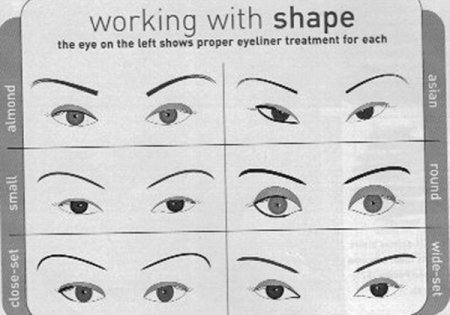 It is a given that most women use black liner for their eyes. Which is not the route to go if you have green eyes. To be honest black is the color that you want to avoid for any eye color. Now this is going to sound weird but you can go with a steel gray or a darker brown for the eye liner. Avoid gray shadow, the gray liner will open the eye up but gray shadows will have the opposite effect. Also if you have smaller shaped eyes you can go with a gold or even a white, this will widen the eyes. The first thing that you are going to want to do is place a crystalline to the entire eyelid. This is almost a yellowish cream that will highlight the eye. Now you can use either the apricot color or taupe and place this over the entire eye lid. Now you want to blend this right on top of the crease of the eye. Take the third color you will be using like a warm chocolate brown color or a deeper brown you may like next. Now take it and go from the inside corner of your lid and take it right to the outside corner of the lid, but do not forget to blend this color in. It will be thicker as you go out. This is what you want it to look like. Go ahead and place the eyeliner and mascara you have chosen like you always do. These tips will help your beautiful green eyes look even more stunning than they already do. 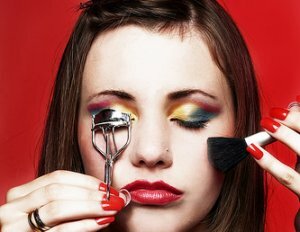 Remember the point of makeup is to have fun and experiment. You will eventually find the perfect look just for you. Share a link to a page on Makeup Tips For Green Eyes and we will consider it for placement on this page.